Congress+($4.99 Universal) is a congressional resource app that is easy enough for a 6 year old and packed with enough features for Carl Rove. This is the mid level app made by Cohen Research Group. 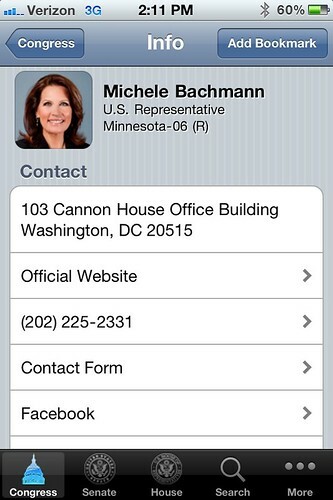 The app features contact info for everyone in the senate and the house and their staff. There are photos and bios of each member and a spot for notes. You can check their fundraising, salary, and staff’s salaries. Every staff member has an email and phone number for the office which is awesome. This is a political junky’s heaven. The bookmark feature is nice for keeping track of representative you have a meeting with soon or just met. You can even check each member’s voting record. This is the greatest political asset I have ever seen. 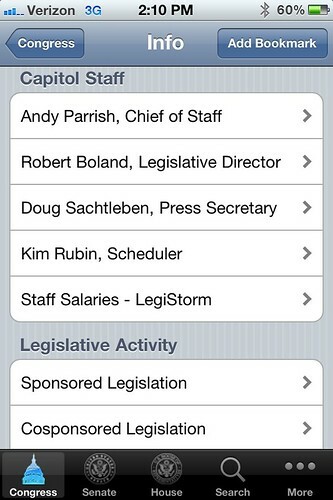 If you don’t need as many features there is a version called Congress($.99 for iphone) which leaves out their Staff and some contact info. If you need more information and are a real pro then you should get the more advanced Congresspro($29.99 Universal). For this hefty price you receive even more features. I didn’t buy it, but according to the description you can follow each member’s social media campaigns, reelection campaigns, competitors. There are even apparently sections for each committee. Conclusion: The Pro app is too expensive unless you are a big lobbyist and the regular app is lacking a few features, but the + app seems to feature just the right amount of info for a fairly decent price. For political junkies the Congress+ app is a worthy buy. Make room on Your Mac- the easy Way.